Will Smith’s Genie from “Aladdin” put on a musical number in footage presented by Disney at CinemaCon on Wednesday, singing the famous song “Friend Like Me” and doing some beat-boxing in a clip that included stunning visuals. Mena Massoud and Naomi Scott star as Aladdin and Jasmine. The film also stars Marwan Kenzari as Jafar, the powerful sorcerer; Navid Negahban as the Sultan concerned with his daughter’s future; Nasim Pedrad as Dalia, Princess Jasmine’s free-spirited best friend and confidante; Billy Magnussen as the handsome and arrogant suitor Prince Anders; and Numan Acar as Hakim, Jafar’s right-hand man and captain of the palace guards. Guy Ritchie is directing. The film is produced by Dan Lin and Jonathan Eirich, with Marc Platt and Kevin De La Noy serving as executive producers. The new live-action “Aladdin” stars Massoud as a charming street rat who meets the courageous and self-determined Princess Jasmine (Scott) and a fast-talking Genie who might be the key to their future. Alan Menken provides the score, which includes new recordings of the original songs written by Menken and lyricists Howard Ashman and Tim Rice, along with two new songs written by Menken and “La La Land” songwriters Benj Pasek and Justin Paul. 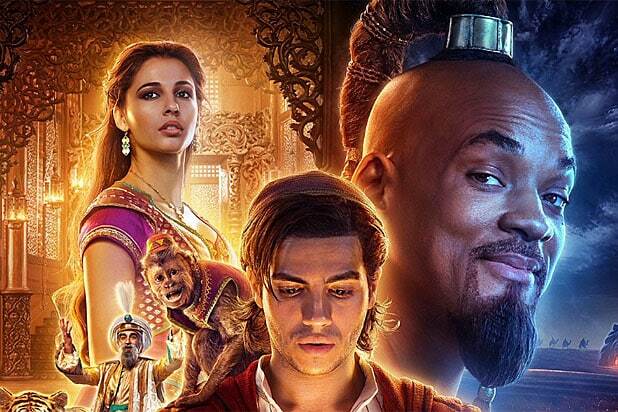 “Aladdin” flies into theaters on a magic carpet on May 24.